The General Tommy Franks Leadership Institute and Museum received an honorable mention award in the Outreach or Education Category with a budget of $15,001 and over for their Midland Young Leaders Challenge program during the Oklahoma Museums Association annual awards celebration and dinner Sept. 20. This was the first year for the General Tommy Franks Leadership Institute and Museum to host the Midland Young Leaders Challenge. The program is a world-class summer leadership program offering 30 of the top high school juniors in Midland County, Texas, a face-to-face experience with General Tommy Franks and prominent Midland leaders and the opportunity to develop their leadership, problem solving and communication skills. In this partnership with Midland College and the Midland Independent School District, students are presented with ethical and leadership challenges to improve their leadership ability and confidence through persuasive communication and character and leadership development. The OMA awards recognize achievements from the past 18 months in the categories of conservation, exhibits, promotional pieces, publications, outreach or education programs and technology media. The competition is further divided into project budget categories. In addition, awards for contributions of individuals, groups and businesses to Oklahoma museums or a specific museum in the community were presented. Admission to the General Tommy Franks Leadership Institute and Museum is free. The Museum is open Monday through Saturday from 10 a.m. to noon and 1 to 5 p.m. 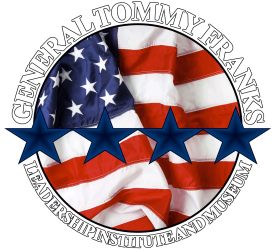 The General Tommy Franks Leadership Institute and Museum’s mission is to advance the development of this world-class leadership training institution and museum. For more information, visit TommyFranksMuseum.org.